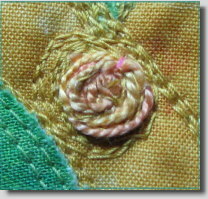 For the flower centers, I used a similar Stitch Witchery technique. First, I cut a small square of fabric and Stitch Witchery. 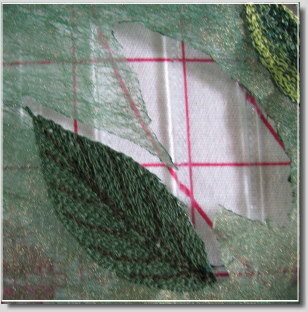 I then backed the fabric square with a fusible interfacing. 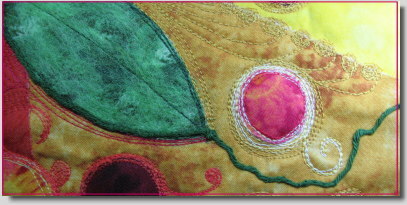 Second, I painted the Stitch Witchery square with Lumiere Pearl Magenta. 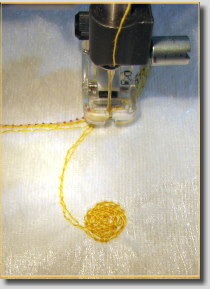 Third, I dropped some metallic threads on top of the fabric square. 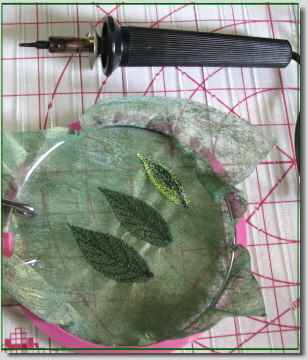 I then topped it with the painted Stitch Witchery and covered the layers with parchment paper. I pressed them on a wool setting for about 10 seconds. 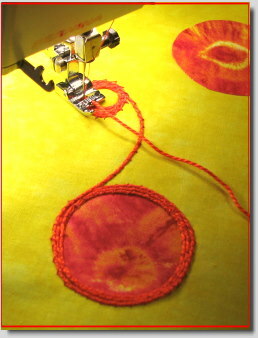 Using a small circle template, I penciled cutting outlines on the back of the fabric and then cut out the circles. 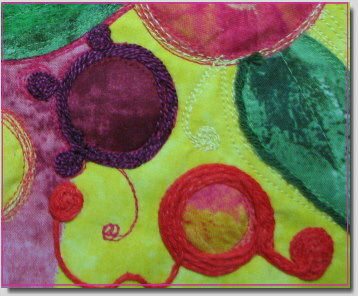 Next, I placed the circles on the background fabric in a somewhat random fashion. The only important thing here was to leave enough room between them for the petals. 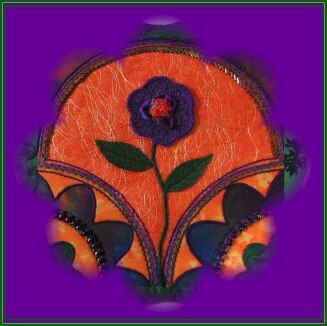 When I was happy with their positions, I tacked them down with a tiny dab of fabric glue so that they would stay in place as I continued working. 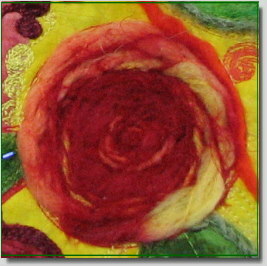 The flower petals were created with Moda Dea Jai Alai (Bloom) eyelash yarn. 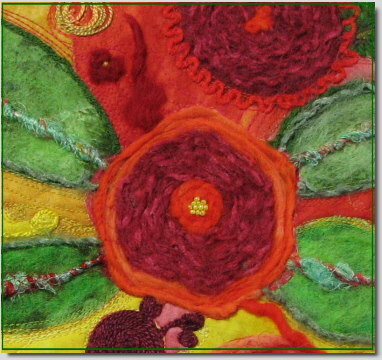 I couched the yarn around the center, first working in a loopy motion to form the petals and then taking a final round at the outer edge of the center. 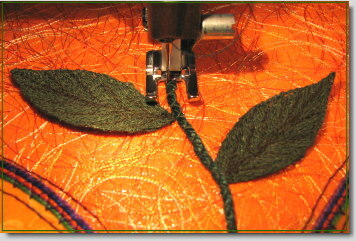 When my flowers were complete, I chose a leaf stitch on my sewing machine and added leaves to the stems. 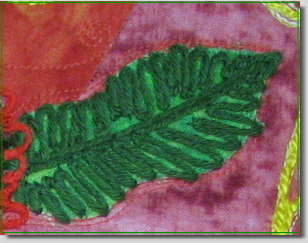 I could have thread painted the leaves, but sometimes I like to use the built-in stitches on my sewing machine simply because they so often go unused! 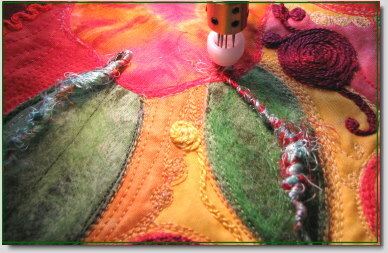 To complete the piece, I added a yellow glass bead to each flower. 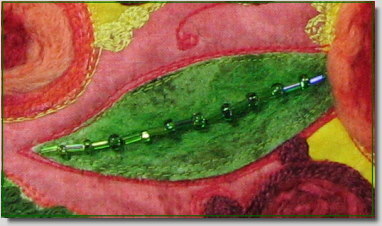 Instead of sewing the beads on with the hole to the side, I stitched them with the hole facing up and used a lighter yellow thread. 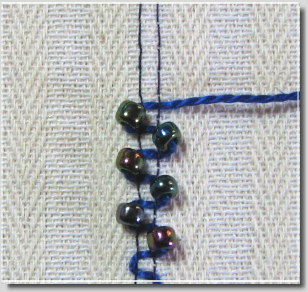 The stitches formed a small “Y” design on the surface of each bead. I really liked the role that Stitch Witchery played in this project. 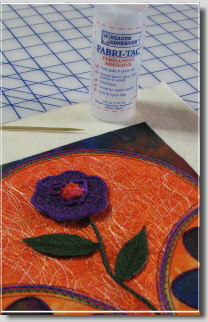 It performed well both as a fusible and as a paint transfer medium without leaving its own footprint. Note: I’ve added another colorform file (fjsquare.dst) to the Fem-Gratis box in the sidebar. Enjoy! I woke up this morning and was greeted by the most beautiful day we’ve had this year. The thermometer said 36 degrees, but it has slowly warmed hour by hour. What a great day to share these whimsical little Angelina flowers growing on a grassy knoll. 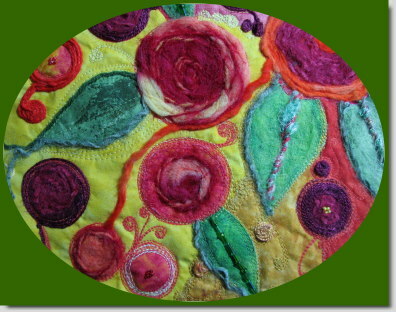 For this project you will need two background fabrics (a sky and a grass fabric), two or three green hand dyed, hand painted, or batik fabrics, some variegated #35 quilting thread (greens, yellows, and roses), green perle cotton and/or heavy rayon fibers, and a wavy edged ruler. 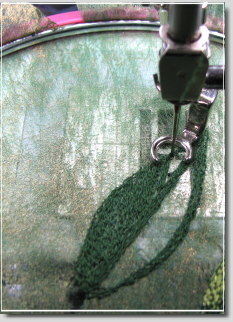 Cut your sky and grass fabrics any size you like, using about a 50/50 ratio. 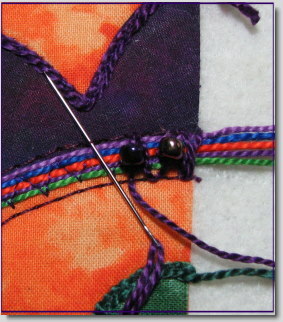 Place right sides together and stitch, using a 1/4 inch seam allowance. 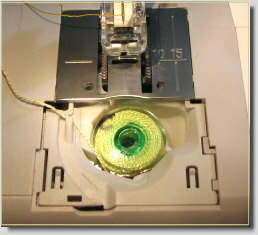 Press the seam to the dark side. 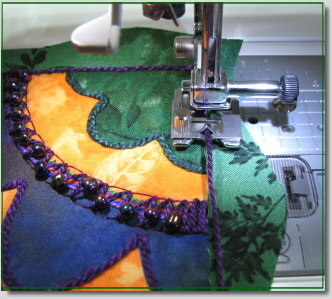 Back your fabric with a heavy stabilizer. I actually used acrylic felt, which I applied with 505 spray. Decor Bond would also work well. 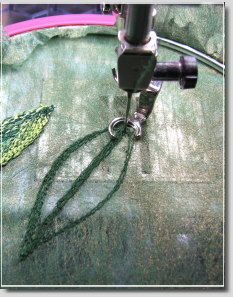 On the right side of you fabric, evenly mark for stem placement. For example, my project measured 15 inches wide, and I marked at 3″, 6″, 9″, and 12″. Measure to figure how long you want your stems to be. 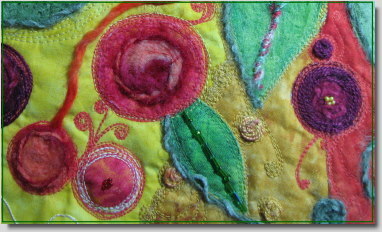 Multiple that number by the number of flowers you want to create. 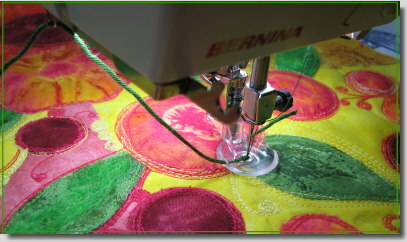 Using your measurement, cut about six lengths of green perle cottons and rayons, and tape them together at one end. 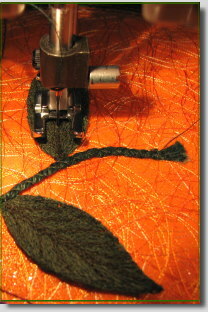 You can cut the strands into quarters and work one stem at a time or leave the strands in one grouping. 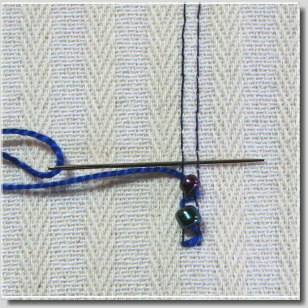 Attach a braiding or cording foot to your sewing machine and thread the needle with a decorative thread. 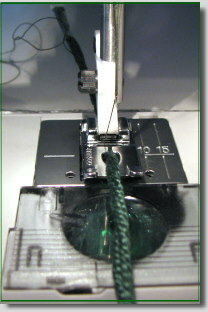 Pass the taped end of your fibers through the hole in the foot. 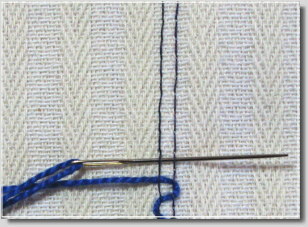 Set your machine on a zig zag stitch and test to make sure the needle clears both sides of the fibers. It helps to twist them slightly as they feed through the hole. 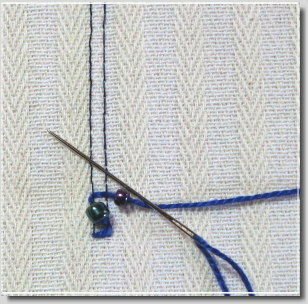 I like the look of the cord after several passes since the cord takes on an organic appearance as the thread builds up. 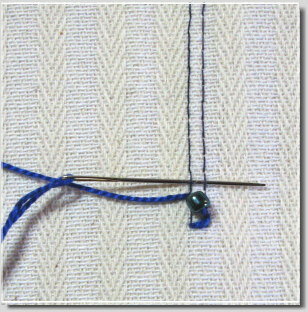 When you cord is complete, couch each section on your background fabric (as previously marked) using the same foot. 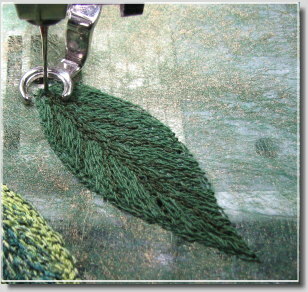 There should be about an inch of stem on the grass fabric. 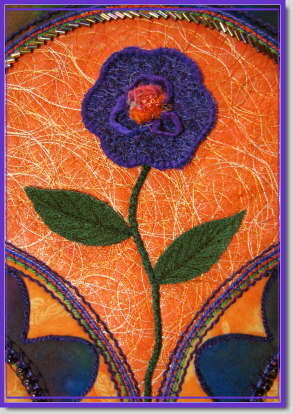 Make sure you leave enough clearance room for your flowers on the sky fabric. In part two, we will create the grassy knolls. 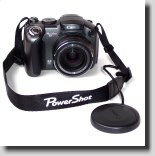 I think you’ll enjoy the technique and find many uses for it in other projects. 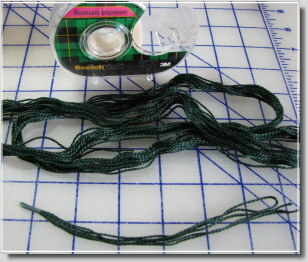 There are many beautiful cords and braids on the market, but sometimes I just like making my own. 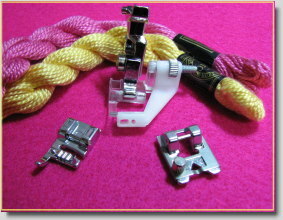 Creating serger braid is easy once you find the correct settings for your particular machine. 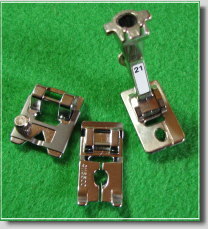 You can use any decorative threads that will fit through the holes in your loopers. 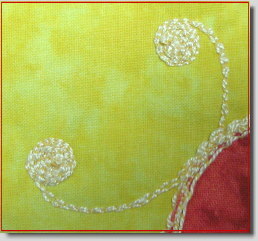 I used Crown Rayon in the loopers and a #40 embroidery thread in the needle for the braids pictured. Once you test your settings and find them satisfactory, simply serge on air, holding the tail taut in one hand as the cord flows towards the back. 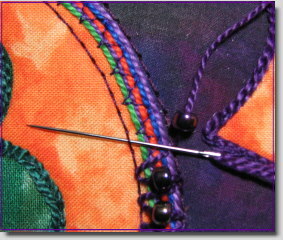 Try to keep a steady speed so that your braid is consistent. 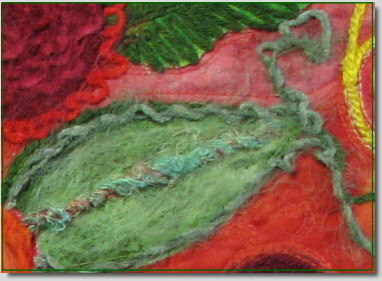 It’s fun to mix colors and experiment with various threads and fibers. However, expect a few problems along the way. Below is the amount of thread I used this morning before getting my machine to behave, and I can tell you I wasn’t a happy camper. But then I looked at the mass of rayon and thought it would make a beautiful sandwiched thread scarf, so you’ll probably see it again soon in another life form. 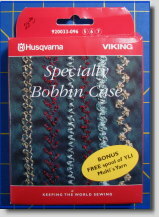 So what do you do with yards and yards of braid? Couch it, of course! 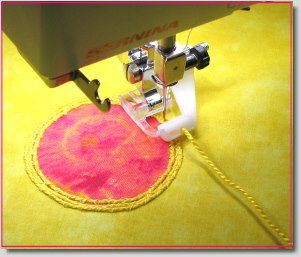 Many of us have wonderful sewing machines with hundreds of decorative stitches that we seldom use. 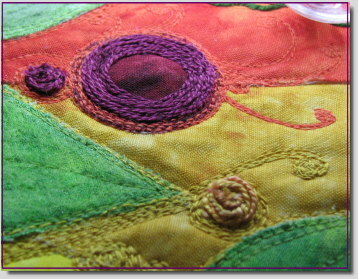 These stitches take on a totally different look when used to couch decorative cords and braids. 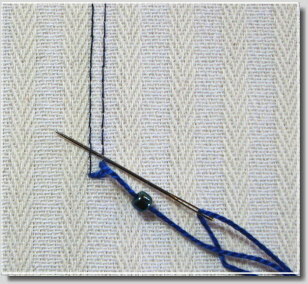 Again, experiment with various threads in the needle, such as variegated embroidery thread. Here are pictures of some samples I did today. 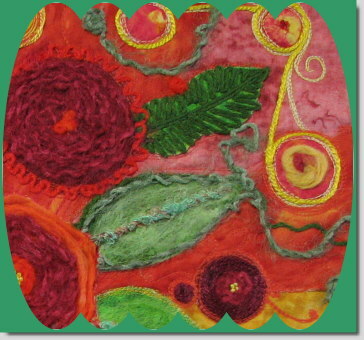 Many of them would make nice frames for ATCs, don’t you think? 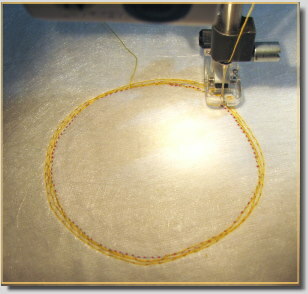 When couching braid, remember to stabilize well. 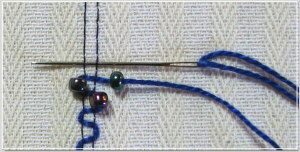 Use an embroidery needle and loosen the top tension. 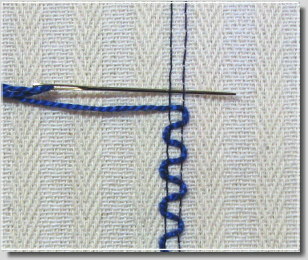 I find it helpful to test stitches and threads, mark the stitch number on the sample, and file it in a reference notebook with pertinent details for future reference.